Keep your firewood and fireplace tools elegantly contained and within easy reach using the Panacea Black Log Bin and Fireplace Tool Set. The square shape, black color, and metal body of this package lends a classic look to your hearth, while keeping your fire tending tools handy. 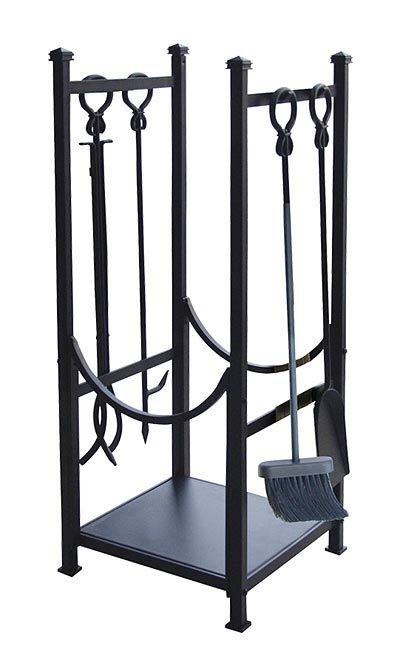 The included broom, shovel, poker, and tongs all hang on integrated hooks at the top of the robust stand, and a rounded handle at the top of each contrasts the square metal of the frame. Curved bars connect the two side panels together, and can also easily hold a few logs for your fire. A solid metal pan at the base of the unit completes this hardy set, and a small point at the top of each upright support adds a touch of style. The black color meshes with your hearth, and the durable, metal construction is perfect for use near a fire. Bring an elegant look to your fireplace with this Black Log Bin and Fireplace Tool Set. Assembly required.